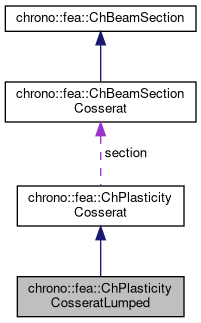 Lumped plasticity of Cosserat-type beams. This defines 6 independent yelds for the six generalized forces/moments in the beam. Note that this is a rough approximation of plasticity in beams for at least two main reasons: it cannot capture how plastic zones are made inside a section (which is mostly important when cycling with back and forth bending), and it does not capture coupled My+Mz effects, or Nx+My or Nx+Mz as often happens. Briefly: use it if plasticization happens in a scenario of pure bending on a single xy or xz plane, or pure compression/extension, or pure torsion. This can be shared between multiple beams. If in plastic regime, uses elastoplastic matrix, otherwise uses elastic.